The Ph.D. is a different kind of degree from the master’s degree. A doctoral candidate in Geography must be capable of making original contributions to knowledge and scholarship. It is unlikely that a person will make such contributions unless he or she concentrates on a narrow and clearly defined field of study. We require, however, that doctoral candidates know more of geography than their particular specialties; thus, any aspirant for a doctorate must obtain master’s training or its equivalent before being admitted to doctoral candidacy. In short, admission to doctoral candidacy is official recognition that a student’s general foundation in the breadth of geography is satisfactory. Students then devote their attention to developing depth in chosen specialties. · a verbal defense of a completed dissertation. The four-year Ph.D. program is reserved for students who have a master’s degree from another graduate program. That can be another geography program at another university, a non-geography program at another university, or a non-geography program at Penn State. Students entering the four-year Ph.D. program must take the doctoral qualifying exam in their first year. 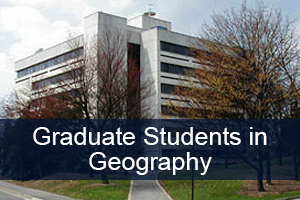 A committee from three of the four fields of geography and formally appointed by the Graduate Program Officer will administer the qualifying exam. The qualifying exam can take place any time during the year, but students in the four-year Ph.D. program typically take it during spring semester. Students in the four-year Ph.D. program complete a comprehensive exam and defend their dissertation proposal in the second year. Depending on the needs of their research, and in agreement with their doctoral committee, students can fulfill these two requirements in either order. Once students have successfully passed their comprehensive exam and defended their proposal, they typically take two years to research, write, and defend their dissertations.